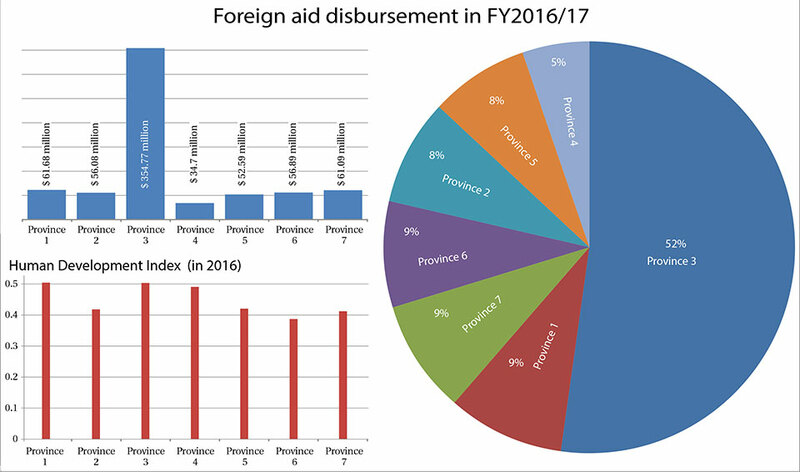 KATHMANDU, Jan 1: More than half, or 52 percent, of total foreign aid in Fiscal Year 2016/17 went to Province 3. The province, which is also home to the capital city, received a total of US$ 354 million worth of foreign aid in the last fiscal year. Remaining six provinces received a combined $323 million only, or about 48 percent of the total foreign aid. The Development Cooperation Report, which was released on Sunday, reveals the yawning gap in foreign aid flow between Province No. 3 and other provinces. The report compiles data of foreign aid disbursement in FY 2016/17 ending mid-July. The trend of centralized budget flow, however, is not new. Kathmandu - the capital city - few neighboring districts have been the major recipients of the budget in the past too. The flow of foreign aid does not match with indicators like Human Development Index (HDI), nor are they disbursed on the basis of geographical priority, according to the report. The Development Cooperation Report shows that Province 3, which ranks second in terms of HDI index, is the top recipient of the foreign aid with a disbursement of $354 million, while the Province 1 and Province 7, which ranked in the 1st and sixth positions, respectively, in HDI index, received the second and third largest share of foreign aid with disbursement of $61.68 million and $61.09 million. Government officials say that they can now streamline the imbalanced spending of foreign aid in a proportionate manner“ "The report provides us an insight for allocating budget in the context of federal set u”," said Minister for Finance Gyanendra Bahadur Karki. Acting Secretary of National Natural Resources and Fiscal Commission, Baikuntha Aryal said that the new fact about foreign aid disbursement has provided them guidance for more inclusive and balanced budget disbursement in the future. The commission has been entrusted the job of determining modalities and parameters of budget distribution among the provinces in the upcoming budget. Meanwhile, foreign assistance flow increased by around 30 percent to $1.39 billion in FY 2016/17. The disbursement of grants saw a growth of 9 percent to $582.39 million loan flow grew by a whopping 46 percent to $548.85 million compared to the previous fiscal year. The increment in loan flow indicates that investment environment in the country is improving. However, technical assistance has seen a robust growth of about 59 percent to $263 million despite the government's target to bring it down. There has also been a major reshuffle in sector-wise foreign aid investment as education has again gained the top position by pushing energy to a distant ninth, according to the report. The education sector was the biggest recipient of development assistance ($127.24 million) mainly due to investment in the School Sector Development Plan. Similarly, local development sector was at the second position with funds of $123 million, while Housing ($112.17 million) and drinking water projects ($110.09 million) were at the third and fourth position, respectively. Meanwhile, the Ministry of Finance has also unveiled a report entitled Development Finance Assessment for Nepal, which assesses the development project financing modalities over the past decade. Likewise, a study report on foreign aid mobilization in federal Nepal was also unveiled on Sunday.